Things that I learn day to day…. Solution: Install latest updates for Visual Studio 2010 I just started on Windows Phone 8 application development and had bit of a trouble setting up my Visual Studio 2012 environment to work with the XAML Designer view. As per the guides I had Visual Studio 2012 and i installed Windows Phone 8 SDK. Then created a new WP project. 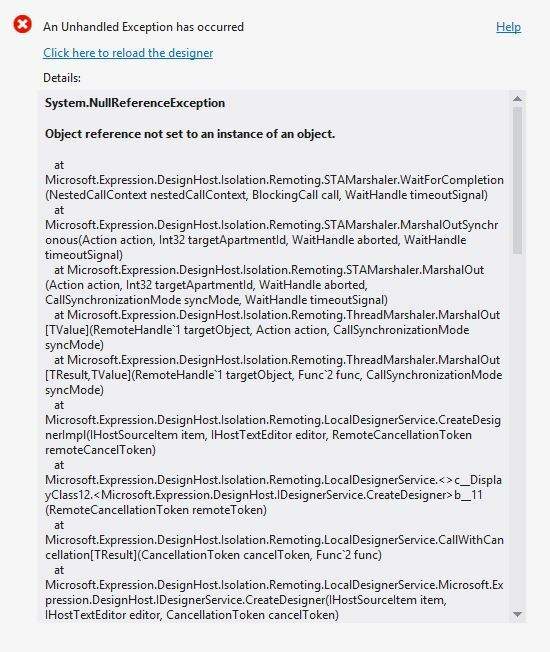 Then Visual Studio loaded with a error on the XAML designer view. “An Unhandled Exception has occurred System.NullReferenceException Object reference not set to an instance of an object. at Microsoft.Expression.DesignHost.Isolation.Remorting.STAMarshaler.Wait… ” I googled about this but couldn’t find any proper solution for it. Some has mentioned to repair the Visual Studio installation and then to repair SDK. But it didn’t work. So i tried with Visual Studio update, At the moment the Update 3 is the latest. I installed the updates and tried to load the project and it worked as a charm. Hope this will help some one.